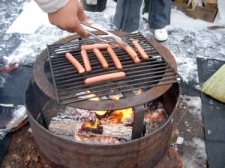 As he was standing by the campfire at Campbell Rink yesterday, Dougal from the Diggin group asked who was paying for the free hot dogs that were grilling on the fire. He was told "Dufferin Rink cookie money" (i.e profits from the Dufferin Rink snack bar). Despite the low price of the snack bar food over at Dufferin Rink, there's still some extra to put back into the park or into other parks. We said to Dougal, "hot dogs don't cost much anyway, nor does hot chocolate powder -- it's easy to put together some snacks for Campbell Rink." CITY IN A PARK-WHAT IF WE STARTED LOOKING AT THE IDEA THAT NEIGHBOURHOODS COULD BE RUN FROM PARKS? I wonder what starts people down the paths of their fascinations – city planners, for instance. Children’s blocks? A romantic encounter in an urban square? My first exposure to planning came unexpectedly. Maybe I was protesting too soon after September 11. And maybe I was mouthier six years ago. A constable was searching my knapsack. But soon he and I were agreeing that policing couldn't make us safe. Unless you design neighbourhoods so people can care for each other, he said, the police will be forever doing mop-up. His superior silently poured the juice from my lunch onto the street to illustrate the point. How much for a City parking lot? (:letter:) I am not sure what logical argument can be extended by the City to expropriate a historical building and tear it down for 20 parking spaces on a streetcar line in 2007. What if Media Articles were less Polarizing? We present two articles on local concerns, written within a week of each other, which -- in their original versions Sue-Ann Levy's Toronto Sun article, Paul Terefenco's NOW Magazine article -- seem to further polarize public discussion. What if explicit or implicit insults are removed? Could the issues raised in these articles lead to a working out of some solutions? What follows are versions of the originals as re-written by a CELOS researcher, to explore this idea. As theatre the drama now playing at City Hall merits a below-average rating. Even by the standards of 100 Queen Street West, the hysteria over the new taxes is over the top. The key players have all settled into predictable messages. But in this excitement there is an opportunity to develop some principles for better governance. Let’s hope that Council doesn’t lose sight of the underlying reasons for the current financial position. With any luck we won’t have a repeat performance next year. When Mayor Miller raised the alarm, City managers decided that one way to save money was by cutting the hours of Parks and Recreation part-time workers. Community centres are to be closed on Mondays; outdoor ice rinks are to stay locked until January; golf courses will close a week early; and the cleanup workers will disappear from the parks well before the leaves fall.